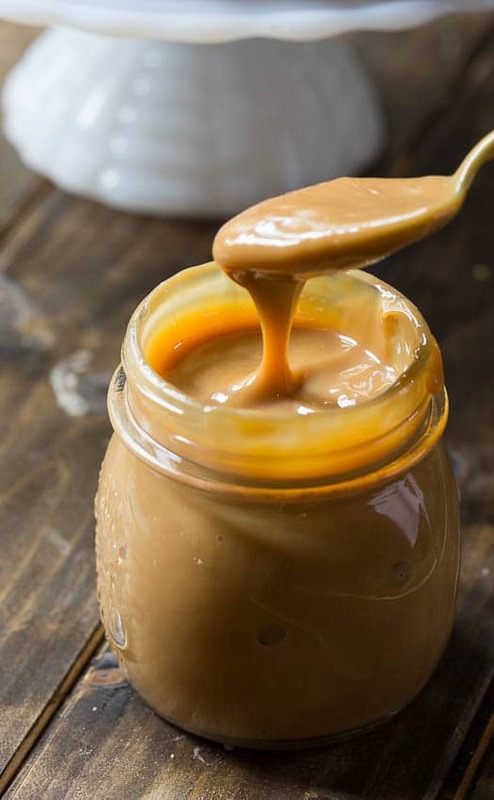 Dulce de Leche made in a crock pot is the easiest way to make caramel sauce ever. Only one ingredient needed – sweetened condensed milk. 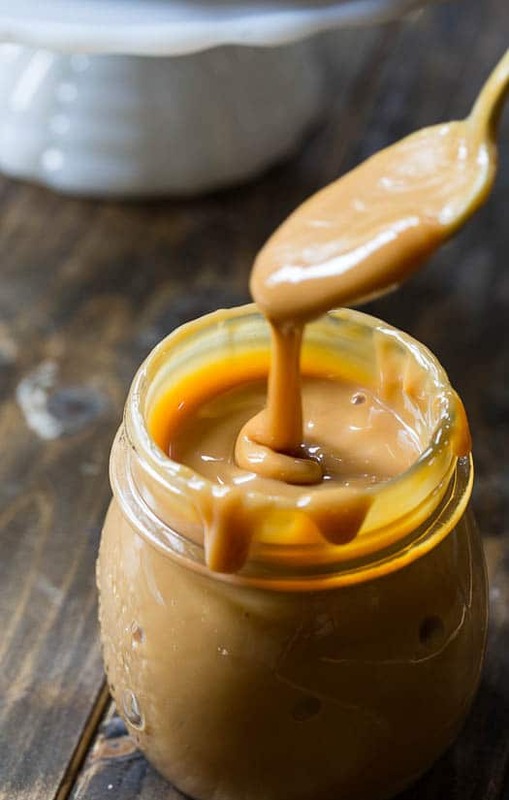 All it takes is 8 to 10 hours in the crock pot and you have dulce de leche that’s milky and smooth, much better than store bought. Making homemade caramel sauce is also much cheaper than store bought. I used 2 (14-ounce) cans of sweetened condensed milk and filled 3 mason jars with it. 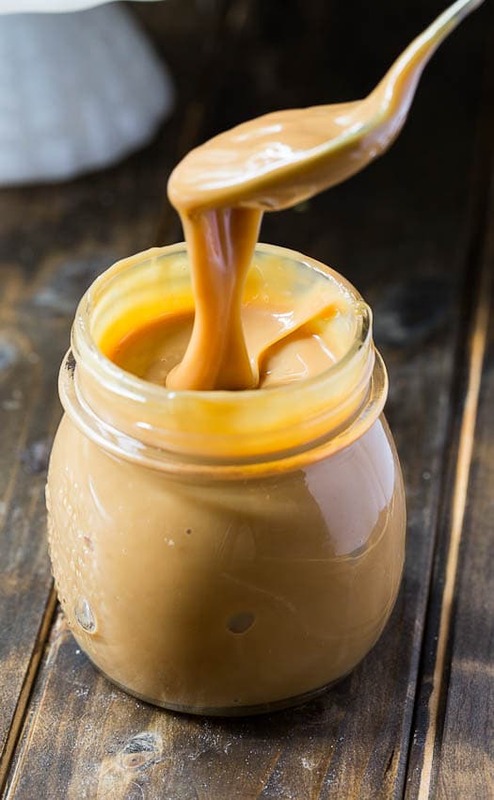 Note: some people make dulce de leche by putting the unopened cans of sweetened condensed milk in the crockpot, but it is much safer to transfer the sweetened condensed milk to mason jars. Screw the lids on tightly and place them in your crock pot. Cover with 1 inch of hot tap water, place the lid on, and cook on LOW for 8-10 hours. How easy is that? My jars were a little on the tall side and I could only get the water up to the top of the lid. I ended up cooking two of the jars upright and 1 on its side to compare and they both came out perfectly. It is best to use mason jars that are short and wide like these Jarden Home Brands 1/2Pt wide Mouth Jar Canning Jars . Cook them for 8 hours for a lighter, more pourable sauce and closer to 10 hours for a darker, thicker dulce de leche. I did mine for about 8 1/2 , but you can get the sauce much darker and almost custard-like if you cook it longer. The jars should be cooled on the counter to room temperature and then stored in the refrigerator where they will keep for at least a few weeks. It probably won’t be long before it’s all gone though because Crock Pot Dulce de Leche tastes good on so many things. Use it on ice cream, cheesecake, or as a dipping sauce for fruit. Tomorrow I’ll be sharing an apple fritter recipe that it tastes wonderful with. 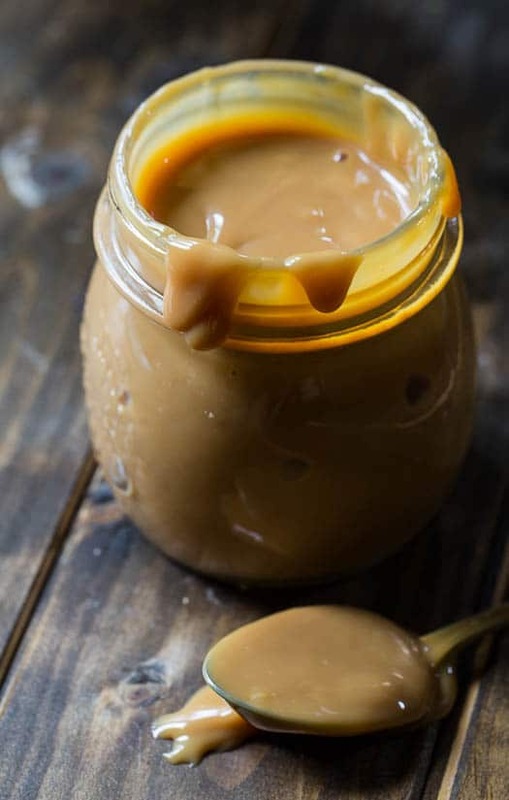 Easy dulce de leche made in the crock pot. 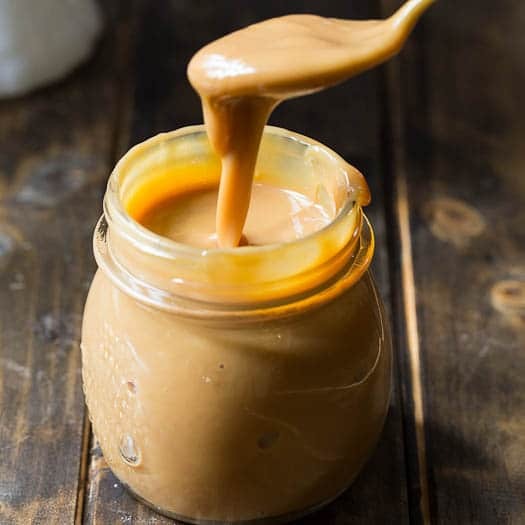 Only 1 ingredient needed for this creamy and smooth caramel sauce. 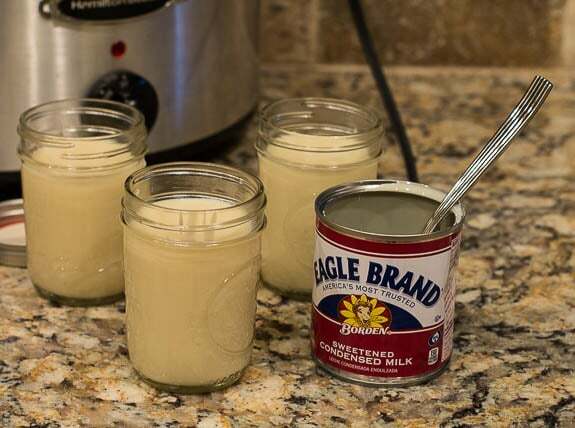 Pour the sweetened condensed milk into the Mason jars, filling to the top. Tightly screw lids on. Place upright in a large crock pot. Pour hot tap water into the crock pot to cover the jars. There should be about 1 inch of water above the lid of the jars. Place lid on crock pot and cook on LOW for 8 to 10 hours, depending on how dark and thick you want it. Carefully remove jars from crock pot using tongs. Place on counter and let cool to room temperature. A little rust may form on the lids. If so, wipe it off with a paper towel. Store in the refrigerator. It will keep for at least 2 weeks. Reheat in the microwave to make it pourable. This entry was posted in Other Desserts and tagged caramel, crockpot recipes, slow cooker. Bookmark the permalink. or, you can just put a can or two in your cupboard in florida in an unairconditioned house and leave them there for a year or so.. turns into dulce de leche all by itself! When you talk about putting the “lid on the mason jar” I’m assuming you mean a regular mason jar “canning lid”. That is, a two-part “ring and rubber-edged lid”. Is this right? Or did you mean something else? 1. Place the unopened cans into a pot large enough to hold them. 2. Cover the cans with water and over medium-high heat, bring to a simmer. 3. Reduce the heat and gently simmer for 2 hours. Keep an extra pot of boiling water on the side to replenish evaporated water from the pot. The cans of condensed milk should always be covered by simmering water. 4. When cooked, let the cans cool in the water bath. When cooled, remove the cans. 5. Open the cans, scoop out the Dulce de Leche and serve. If you are cooking this in un-opened cans, why wouldn’t it be shelf stable for ages if you did not open the can? And why is it that the cans don’t explode? I made it in the cans years ago and it said it would be fine unopened for 1 year (it was gone long before that though lol). I’m not sure why they don’t explode as long as they are covered in water. It said to make sure they had plenty of water or they WOULD explode. You can also make carmel pie! Just cook the sweeten condensed milk to make the carmel and let it cool enough to handle. Carefully open the jars and pour into a graham cracker crust. Let it cool in the refrigerator until ready to serve. Top with whip topping and enjoy! ? I advise not putting the actual cans of condensed milk in the crockpot. I think they get too hot and damage the crock. I did this with mine and eventually one day, several years later, the entire bottom of my crockpot blew off while I was cooking a chicken in it. Coincidentally right where the cans had left marks on the base. I think I overcooked mine! It was probably more on the 10 hour side, so it is thick and custardy. I made it to drizzle over the pecan pie cheesecake recipe, so I need to get it to the pouring consistency. Is there any way I can get it back? I was thinking maybe warming it in a pan with some heavy cream, but I don’t want to ruin it more! My jars are to tall. So I’m rolling with them on their sides in the crock pot. Crossing my fingers! I made a cheesecake that it is waiting for! Thanks for such a wonderful easy tip. Crock pot over night with the timer. Way better then standing at the stove for two hours! Hope it turned out well Katie! Followed directions exactly and after 8 1/2 hours it was just a lumpy pudding like consistency?? It also didn’t taste very much like caramel sauce, still really tasted just like sweetened condensed milk. Don’t know what happened? If it was lumpy, I’m guessing the heat was too high and the milk curdled. Do you find your crock pot runs hot? I’ve heard a few people say they had a few lumps and they easily whisked them out. It should taste like Dulce de Leche which has a similar taste to caramel but is not the same thing. Awesome. Thanks for sharing your recipe. Turned out perfect following your very good directions. Enjoying some in my morning coffee at this very moment. Yummy! Ih I’m jealous you had some in your morning coffee! That sounds incredible! Yes, it is. It really is! Could bakers cocoa powder be added to the condensed milk and make it a chocolate dulce de leche? I’ve got them in my crock pot now, but the jars are floating…I don’t know how to keep them down. Hope it doesn’t affect the cooking process. Ok, this looks so delicious and so easy to make, am certainly going to try it…thank you….One question thou, how in the heck does the milk turn to the carmel sauce??? It has lots of sugar in it that caramelizes as it heats. How beautiful and inviting! Awesome tutorial! Pinning! You can just put an unopened can of sweetened condensed milk in a potful of boiling water on the stove and boil away for two hours. Don’t let the water evaporate. Open carefully–it will boil out like hot lava. Really want to try this.. is it possible to do it without a crock pot? I love dulce de leche but have never made it myself before. This recipe is just the perfect excuse for my to pull out and use my slow cooker.. you definitely can consider I will be recreating it! I have a question……if you’re just re-canning this basically….why wouldn’t it be shelf stable like it is when in the can ? I would very much like to include this in my gift baskets…..
I’m by know means a canning expert but I have researched this question and there seems to be a lot of conflicting information. I would err on the side of caution and refrigerate it. That being said, it would be fine to leave out for a number of hours so I would put it in a gift basket with a note to refrigerate as soon as possible. Gahhhh this sauce looks so so cozy and comforting! I’ll bet it makes your house smell totally amazing while it’s slow-cooking! Gorgeous photos, Christin! Now this is useful information! I love just dumping that condensed milk in and forgetting about it. pinning! Oh my Gosh! I hope you are not teasing us. Too tooooooooooooo easy. I have the pot, the jars and the condensed milk. Wow!!! I am excited. I can’t believe I’ve never tried this. I think it was because I didn’t want to put the can of milk in the crock-pot. Love the tip with the mason jars. Must try! Dulce de leche is my absolute weakness, Christin! In ice cream, cakes, pies, etc…it’s a flavor that I’m always drawn to. I love this crock pot version! Looks amazing. Pinned! Girl I can’t even stand how delicious this looks! I love this recipe Christin! I am a sucker for dulce de leche and have wanted to make my own for a while but didn’t want try the hot oven method especially in the summer. A crock pot version sounds perfect! I am drooling over those jarfuls – looks mouthwatering! Incredible! I honestly just can’t believe this works! But look at that proof… yummm! !